Maternal Vitamin D status affects the Vitamin D levels in infants who are exclusively breastfed. Maternal Vitamin D deficiency has been known to adversely affect skeletal, cardiovascular, respiratory, and neuronal functions of the newborn. Low maternal levels during pregnancy have been linked to various health outcomes in the offspring, including higher incidence of abortion, low birth weight, neonatal hypocalcemia, impaired development, and rickets. In countries where sunshine is abundant throughout the year, the magnitude of Vitamin D deficiency is still huge. Term babies, who were earlier considered to be a high-risk population for Vitamin D deficiency, are increasingly being found to be deficient in multiple studies. In India, studies have reported deficiency levels ranging from 50% to 86.5% for newborns and young infants., There remains considerable debate over the serum concentrations of 25, hydroxy Vitamin D (25[OH]D) associated with optimal health and cutoff points have not been developed by a scientific consensus process. Till date, specific range for neonates is not available. This study was thereby undertaken to know the status of Vitamin D in cord blood and to find out the prevalence of its deficiency. This is a cross-sectional observational study. The study was conducted in a tertiary care neonatal unit. The sample size was calculated based on the prevalence of 80% newborns deficient in Vitamin D, Assuming an alpha error of 0.05 and power of the study as 80%; it is 247, a total number of 311 patients were enrolled in this study [Figure 1]. Babies of all gestational ages born by singleton deliveries with an Apgar score of more than 7 at 1 min of age were included in this study. Neonates with detectable gross congenital anomalies, with evidence of respiratory distress, requiring any resuscitative measures at birth were excluded from the study. Babies born to the mother having any chronic illness such as congestive heart failure, essential hypertension, diabetes mellitus type 2 or any organic disease in particular neurological, endocrine, liver, kidney abnormality, or any thyroid/parathyroid abnormality or on any medication related to these disorders were also excluded from the study. Socioeconomic status (SES) of the families enrolled in the study was taken according to Modified Kuppuswamy Scale with Consumer Price Index for Industrial workers, 2012. Informed and written consent from parents of the eligible neonates was taken. The ethical clearance from the research committee was also obtained before the start of this study. Umbilical cord venous blood was obtained after the clamping of the cord from the fetal end. Four ml of sample was withdrawn, and serum was collected using standard sampling tube or tubes containing separating gel (Li-heparin and K3-EDTA). The 25(OH)D levels were analyzed using electrochemiluminescence binding immunoassay technique (Modular Analytics E 170 and Cobas e 411). Samples were processed within 3–4 h.
Most experts agree that Vitamin D deficiency should be defined as 25(OH)D of ≤20 ng/ml. Vitamin D insufficiency is recognized at 21–29 ng/ml. Similarly, the US National Kidney Foundation considers the level for 25(OH)D ≤20 ng/ml to be insufficient or deficient. The Endocrine Society of North America defines Vitamin D levels as insufficient below 30 ng/ml, and deficient below 20 ng/ml in both adults and children. Levels above 30 ng/ml are considered to be as normal levels.,,,, Based on these recommendations, we took Vitamin D deficiency as level of 25(OH)D ≤20 ng/ml, Vitamin D insufficiency as level of 25(OH)D 21–29 ng/ml, and normal Vitamin D as level of 25(OH)D ≥30 ng/ml. Anthropometry measurements of the baby were taken soon after birth including birth weight, head circumference, and length. Data were tabulated and analyzed statistically with the Statistical Package for the Social Sciences version 14 Software (IBM corporation ltd, New York, USA). Descriptive statistics were used. A correlation analysis was performed using the Pearson's correlation test with logarithmic transformations where necessary. In this study, 255 newborns were analyzed for cord blood 25(OH)D levels. The majority of participants (65.9%) were from the upper middle socioeconomic status, and 32.5% (83) were from the upper socioeconomic status. Only 1.6% (4) mothers were from lower middle socioeconomic status. Average weight gain during the antenatal period was 8.78 ± 1.5 SD kg with a range from 6 to 14 kg. Approximately 45.6% mothers (117) were primigravida and rest 54.1% were multigravida. Out of 255 newborns, the majority (63.9%) were born by cesarean section, and 36.1% were born by normal vaginal delivery. Baseline characteristics of mothers are shown in [Table 1]. The mean gestational age of the babies delivered was 38 ± 2.1 weeks with a mean birth weight of 2.9 ± 0.6 kg, length 47.7 ± 3.2 cm, and head circumference of 33.5 ± 1.9 cm. Gender distribution was almost equal, with 52.15% (133) females. The majority (91%) of the newborns were appropriate for gestational age whereas only 5.5% (14) were small for gestational age and 3.5% were large for gestational age. Baseline characteristics of neonates are shown in [Table 2]. Nearly, 73% (187) of the babies had deficient cord Vitamin D levels. One hundred and twenty-five (49%) cord samples were severely deficient that is levels were <10 ng/ml [Table 3]. When the comparison between the mean birth weight, mean head circumference, and mean length in deficient cord blood Vitamin D group, insufficient, and normal cord blood Vitamin D group was done, the anthropometry was better in children with adequate Vitamin D levels, weight was significantly higher in the babies who had normal cord Vitamin D level. The majority of the neonates were from the upper and upper middle class in the study group. The entire group had mean Vitamin D level within the deficient range; however, upper SES had higher mean value, ANOVA was used as the test of significance in comparing the means between the groups which came out to be statistically significant with P = 0.02 [Table 4]. We did not find significant (P = 0.30) correlation between the values of cord Vitamin D level and the period of gestation. The comparison between the mean weight, mean head circumference and mean length in defi cient cord Vitamin D, insuffi cient and normal Vitamin D group showed that the anthropometry was better in children with adequate Vitamin D levels, weight was signifi cantly (P = 0.02) higher in the babies who had normal cord Vitamin D level [Table 5]. Vitamin D deficiency is a public health issue worldwide. In most countries, neither the routine monitoring of serum 25(OH)D levels during pregnancy occur nor does the routine supplementation with preventive doses of Vitamin D. In this study, we look at the prevalence of Vitamin D in newborns by testing the levels in umbilical cord blood. This study showed a very high prevalence of Vitamin D deficiency in cord blood, with levels <20 ng/ml in 73% newborns. Of these, severe deficiency (level <10 ng/ml) was seen in 49% of cases. Similar results were seen by Song et al. in China where approximately 46% of the neonates had severely deficient cord levels, and by Basile et al. in Charleston, USA, in which 46 of 100 cord samples studied showed severe deficiency. Cadario et al. have shown ethnic differences of high prevalence of Vitamin D deficiency among neonates and their mothers, particularly in the United States, Australia, South Asia, England, Greece, and other European countries. The intake of Vitamin D is also inadequate as food items are not fortified and there is no fixed policy of Vitamin D supplementation to the pregnant/lactating mothers. The majority of the mothers in this study were from upper (32.5%) or upper middle (65.9%) socioeconomic status, the reason being study was conducted in private tertiary care hospital where majority of treatment expenses is borne by the patients; overall in the study, the mean cord blood Vitamin D level came out to be 15.16 ± 14.5 ng/ml. However, when the socioeconomic status groups were compared it was seen that the mean level of Vitamin D was significantly (P = 0.02) higher in babies of the upper socioeconomic status mothers (17.19 ± 1.91 ng/ml) as compared to the upper middle (14.19 ± 1.0 ng/ml) and lower middle socioeconomic status (13.63 ± 3.19 ng/ml). Bhalala et al. studied the Vitamin D level in exclusively breastfed young infants (n = 207) of lower socioeconomic status, the mean 25(OH)D in cord blood was 19.36 ± 9.5 ng/ml. Another study which was done in Lucknow also showed very low mean values of cord Vitamin D (8.4 ± 5.7 ng/ml) in lower socioeconomic group mothers. Similar results were also seen in a study done in Zagazig, Egypt where newborns of mother of lower socioeconomic status had lower cord Vitamin D levels as compared to newborns of mother of higher socioeconomic status. It can be partly explained by better living conditions and standards with more access to healthy enriched nutritive food. In our study, there was no effect on cord Vitamin D levels of maternal age, mean level was in deficient range in both young (<30 years) and elderly gravida (>30 years). Similarly, the level of cord Vitamin D was not influenced by mother parity status or mode of delivery. The levels were equally low in babies delivered through vaginal delivery or through cesarean section. No significant variation in cord Vitamin D level was seen in either nulliparous or multiparous mother. Similar results were also reported by Merewood et al. However, El Koumi et al. found multiparity as one of the risk factors for deficient Vitamin D levels in newborn. The majority of the studies in the literature till date have compared maternal Vitamin D levels and its effect on neonatal anthropometry. 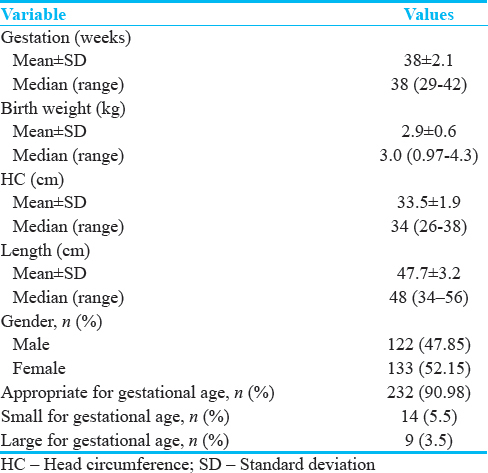 In this study, we tried to study the relation between cord Vitamin D levels and birth weight, length, and head circumference. The mean birth weight of the babies who had normal cord Vitamin D levels was 2.99 ± 0.57 kg which was significantly (P = 0.02) higher when compared to babies having insufficient levels (2.99 ± 0.72 kg) deficient Vitamin D levels (2.80 ± 0.7 kg). It was also observed that there is an increasing trend of length and head circumference in the babies having normal Vitamin D levels as compared to ones having insufficient and deficient Vitamin D levels. However, it was not significant statistically (P > 0.05). The current literature on cord blood Vitamin D levels and low birth weight does not show a strong association between the two. Bowyer et al. 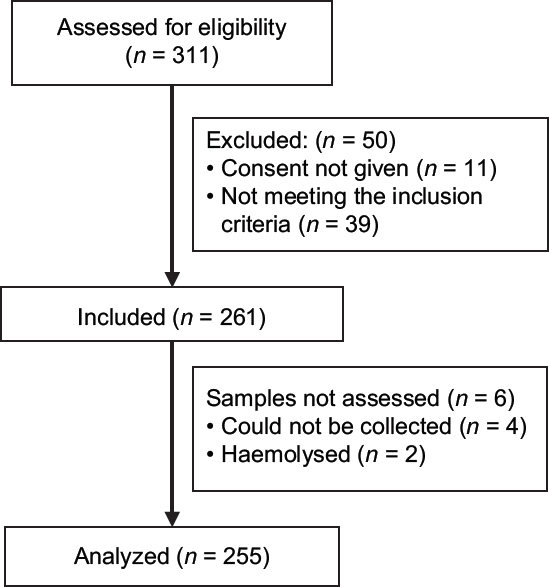 evaluated 901 umbilical cord blood samples, 604 of which were paired with maternal serums. Mothers who were Vitamin D deficient gave birth to lower-weight babies than mothers with insufficient and sufficient levels, by 151 g after adjusting for potential confounding variables. Cord blood 25(OH)D and neonatal birth weight were not found to be related. Camargo et al. also found no association between cord blood Vitamin D status and birth weight. Our study showed high prevalence of Vitamin D deficiency in cord blood. We also observed better cord levels in mother of higher socioeconomic status. Birth weight was significantly higher in newborns with normal cord Vitamin D levels. The major strengths of this study stems from the focus on cord blood. Using cord blood allowed for a more direct measure of the Vitamin D that the fetus received in utero; it potentially provided a better representation of the biologically effective dose. The major drawback of our study was lack of maternal Vitamin D levels which would have been helpful in interpreting our results in the light of available literature. Another limitation was that we did not have the corresponding PTH, calcium, and phosphorus values which could have helped us in understanding the physiology of Vitamin D and its effect on various parameters in a better way. Dietary intake and sun exposure during the antenatal period have not been recorded. Our study showed a high prevalence of Vitamin D deficiency in cord blood. There was also significant association of higher birth weight in newborns with normal cord Vitamin D levels. However considering the limitations of this study further large studies are required. Nesby-O'Dell S, Scanlon KS, Cogswell ME, Gillespie C, Hollis BW, Looker AC, et al. Hypovitaminosis D prevalence and determinants among African American and white women of reproductive age: Third National Health and Nutrition Examination Survey, 1988-1994. Am J Clin Nutr 2002;76:187-92. Harinarayan CV, Joshi SR. Vitamin D status in India – Its implications and remedial measures. J Assoc Physicians India 2009;57:40-8. Scholl TO, Chen X. Vitamin D intake during pregnancy: Association with maternal characteristics and infant birth weight. Early Hum Dev 2009;85:231-4. Liu NQ, Kaplan AT, Lagishetty V, Ouyang YB, Ouyang Y, Simmons CF, et al. Vitamin D and the regulation of placental inflammation. J Immunol 2011;186:5968-74. Shin JS, Choi MY, Longtine MS, Nelson DM. Vitamin D effects on pregnancy and the placenta. Placenta 2010;31:1027-34. Seth A, Marwaha RK, Singla B, Aneja S, Mehrotra P, Sastry A, et al. Vitamin D nutritional status of exclusively breast fed infants and their mothers. J Pediatr Endocrinol Metab 2009;22:241-6. Mahon P, Harvey N, Crozier S, Inskip H, Robinson S, Arden N, et al. Low maternal Vitamin D status and fetal bone development: Cohort study. J Bone Miner Res 2010;25:14-9. Bhalala U, Desai M, Parekh P, Mokal R, Chheda B. Subclinical hypovitaminosis D among exclusively breastfed young infants. Indian Pediatr 2007;44:897-901. Agarwal R, Virmani D, Jaipal ML, Gupta S, Gupta N, Sankar MJ, et al. 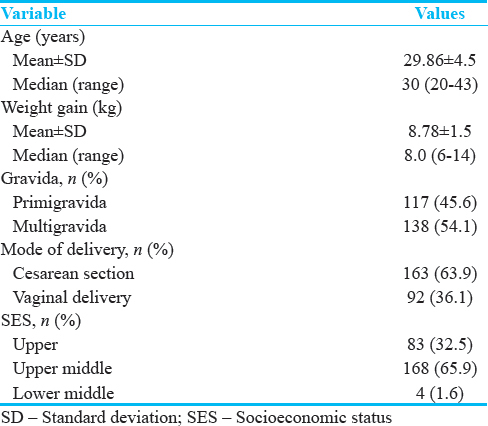 Vitamin D status of low birth weight infants in Delhi: A comparative study. J Trop Pediatr 2012;58:446-50. What's the D-eal with Vitamin D? ; 12 August, 2014. Available from: https://www.kidney.org/transplantation/transaction/TC/ Summer13/Whats-the-D-eal-with-Vitamin-D. [Last accessed on 2016 Nov 15]. Institute of Medicine (US) Committee to Review Dietary Reference Intakes for Vitamin D and Calcium. Dietary References Intakes for Calcium and Vitamin D. Washington, DC: The National Academic Press; 2011. Song SJ, Si S, Liu J, Chen X, Zhou L, Jia G, et al. Vitamin D status in Chinese pregnant women and their newborns in Beijing and their relationships to birth size. Public Health Nutr 2013;16:687-92. Basile LA, Taylor SN, Wagner CL, Quinones L, Hollis BW. Neonatal Vitamin D status at birth at latitude 32 degrees 72': Evidence of deficiency. J Perinatol 2007;27:568-71. Cadario F, Savastio S, Pozzi E, Capelli A, Dondi E, Gatto M, et al. Vitamin D status in cord blood and newborns: Ethnic differences. Ital J Pediatr 2013;39:35. Sachan A, Gupta R, Das V, Agarwal A, Awasthi PK, Bhatia V, et al. High prevalence of Vitamin D deficiency among pregnant women and their newborns in Northern India. Am J Clin Nutr 2005;81:1060-4. El Koumi MA, Ali YF, Abd El Rahman RN. Impact of maternal Vitamin D status during pregnancy on neonatal Vitamin D status. Turk J Pediatr 2013;55:371-7. Bowyer L, Catling-Paull C, Diamond T, Homer C, Davis G, Craig ME, et al. Vitamin D, PTH and calcium levels in pregnant women and their neonates. Clin Endocrinol (Oxf) 2009;70:372-7. Camargo CA, Ingham T, Wickens K, Thadhani RI, Silvers KM, Epton MJ, et al. Vitamin D status of newborns in New Zealand. Br J Nutr 2010;104:1051-7.